Recently at Content Bloom we’ve been competing with each other to see who can build the best Alchemy Plugin in their spare time. Harald Hoffelinck entered first with his exciting Google Analytics plugin. Then Rob Morrow came with the Theme Manager, which you’ll definitely want if you spend all day staring at Tridion and need a change of view (or for lots of other reasons). Next, Mark Williams released the DXA Preview plugin, combining two of the hottest Tridion technologies right now in DXA and Alchemy. 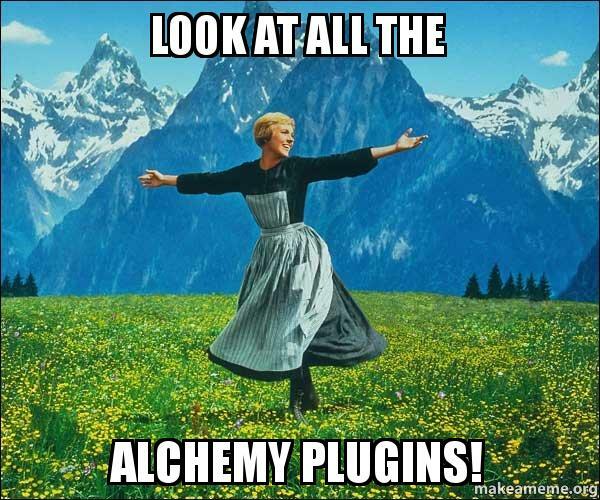 Best of all, even more exciting plugins are on the way from this little contest, so keep your eye on the Alchemy Webstore and here on Tridion Developer to see what comes next. Do this a few times and good luck trying to look back through the path you followed from Component 1 to the page. Is it a minor annoyance? Maybe, but still an annoyance. My plugin offers a solution (actually 2) in the form of a new “Where Used Plus” tool to add to Tridion. Where Used Plus is accessed exactly as you access Where Used today, through the ribbon bar or the context menu. 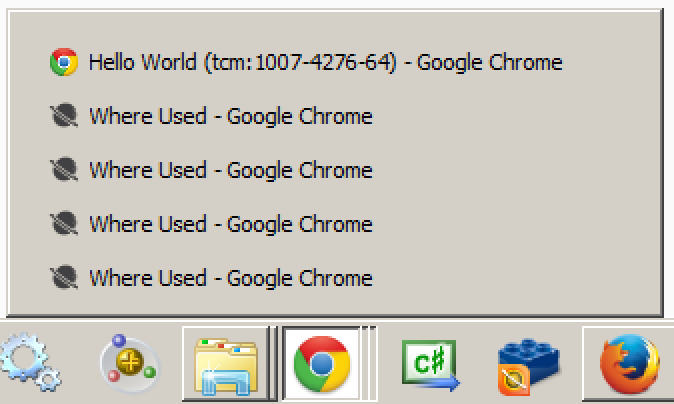 As you can see, Where Used Plus looks similar to the default Where Used. It shows you where a Tridion object is used, shows you what items it is using, and lets you open and go to the location of any item you select in the popup. However, you’ll notice a few differences that help to streamline the process of moving between multiple Tridion items. First, it has tabs a new set of tabs. These tabs let you flip back and forth between the where used and using information for multiple items easily. No longer will you need a bunch of non-descript browser popups to move up and down a dependency chain. Second, the “Pages Where Used” button. This button lets you skip any intermediate items and get straight to the page using any item, whether it’s a component, a schema or a template. 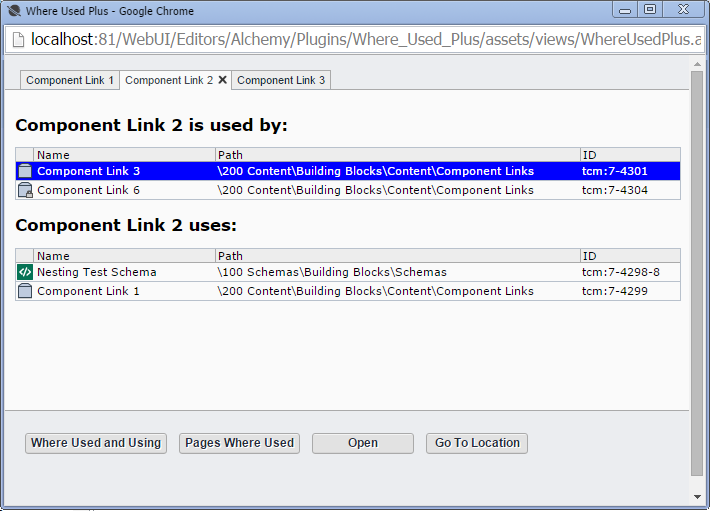 In the above example I could go straight from Component 1 to my page, never touching Components 2 or 3. There are a few features I’d like to add down the road, including search and filtering, and a “published to” option, to make this new tool a true replacement for the default Where Used tool. For now though I think there is enough new functionality here to warrant a place in your ribbon bar. Note: This is a beta version, so any comments or reviews on the Alchemy Webstore would be more than welcome as I consider what changes will go into version 2. This entry was posted in A4T, Extensions, UI by Tanner Brine. Bookmark the permalink. 1. The plugin does not have an icon for the minified version of the ribbon. 3. Some items do show uses/using items with the built-in functionality, but in the where used plus plugin the list of uses/using items remains empty. The tool seems to be stalled/waiting. This happens on Chrome and Firefox.